More space action! More Guardians! More...Ben Grimm? After a brief text prologue that informs us that "the entire galaxy is a mess" we learn things have changed for the Guardians of the Galaxy. Peter Quill has now taken over from his father as ruler of Spartax and finds himself dealing with unwanted attentions and taxation of trade route debates. 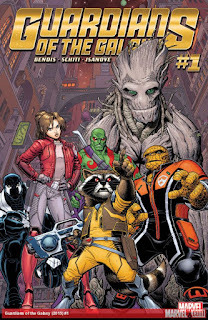 The team now has new members Ben Grimm and Kitty Pryde (taking Quill's position as Star-Lord) and after barely surviving a fight with the Chitauri come into possession of a mysterious artifact who needs experts. A trip to Spartax seems the best solution but as the usual shock ending reveals the Guardians are in their usual trouble. With Marvel now relaunching their entire Universe with new number ones, I took a chance on this and Invincible Iron Man and so far they have been fun but this one has the edge. 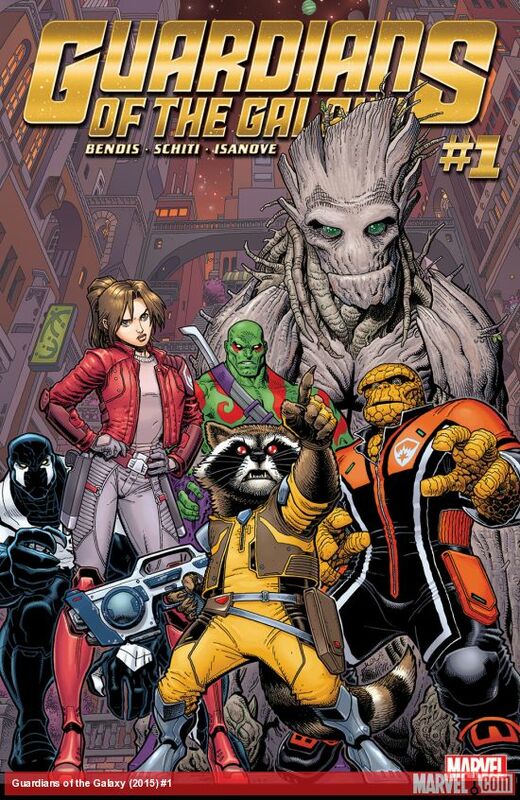 Credit goes to Brian Michael Bendis, who brought together the last version of the Guardians and now is handling the new team. Thankfully he retains the humor and fun while crafting a thrilling sci-fi tale. The addition of the Thing and Kitty is also excellent, even if it is still Rocket who steals the show. Complementing the story is the artwork by Valerio Schiti. Schiti captures the flavor and characters well, setting them up with a sure hand. Plus the opening spread showing the Guardians is a jam packed joy to look at. Schiti also accentuates the humor of this issue. Just check out Quill's attempt to avoid an amorous alien and try not to laugh at the facial expressions. 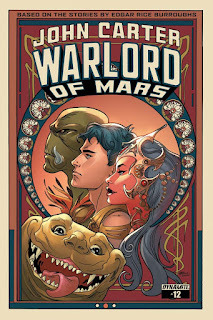 If you love humor, science fiction and action than this might be what you're looking for. Enjoy and have fun with the new Guardians of the Galaxy! Until next time folks.